Strange new materials that propel the fictional Star Trek universe are being developed by scientists in reality today. 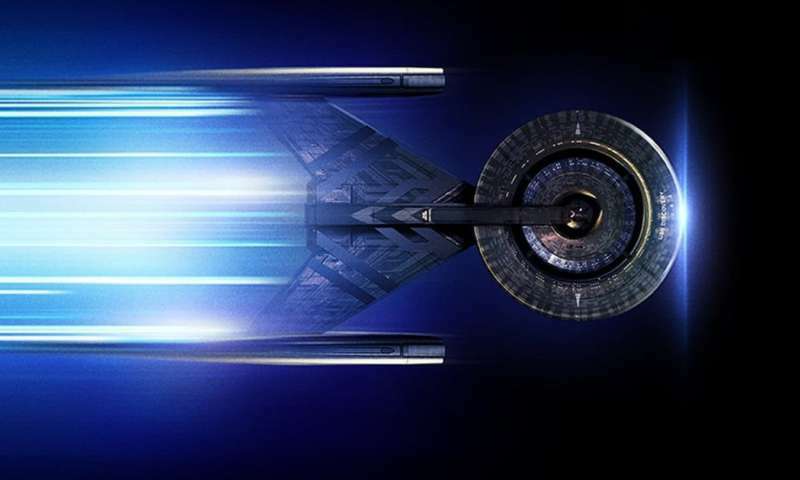 Above, the USS Discovery accelerates to warp speed in an artist’s rendition for the TV series Star Trek Discovery. If you think technologies from Star Trek seem far-fetched, think again. Many of the devices from the acclaimed television series are slowly becoming a reality. While we may not be teleporting people from starships to a planet's surface anytime soon, we are getting closer to developing other tools essential for future space travel endeavours. I am a lifelong Star Trek fan, but I am also a researcher that specializes in creating new magnetic materials. The field of condensed-matter physics encompasses all new solid and liquid phases of matter, and its study has led to nearly every technological advance of the last century, from computers to cellphones to solar cells. My approach to looking for new phenomena in materials comes from a chemistry perspective: How can we create materials that have new properties that can change our world, and eventually be used to explore "strange, new worlds"? I believe an understanding of so-called "quantum materials" in particular is essential to make science-fiction science fact. What makes a substance a quantum material? Quantum materials have unusual and fantastic properties that arise from enormous numbers of particles acting in a concerted way. Think of a conductor directing a symphony: without some order brought to the music, all you have is noise. The more musicians you have performing out of step, the more noise you will have. A quantum material has all of the constituent musicians—in this case, the electrons or atoms in a material, which amounts to billions upon billions of particles—acting in a certain way according to quantum rules, or the "sheet music," if you will. Instead of noise from random electronic and atomic motions, with a conductor you get music—or in the case of new materials, a new property that emerges. The use of these new properties for devices is what is driving the technological revolutions that we are seeing today. So, how can these new materials be used in the spacecraft of tomorrow? One example might be the force-shields that protect ships in Star Trek. High magnetic fields could be used to protect bodies from incoming projectiles, especially if the projectiles have an electric charge. How do you create large magnetic fields? One way is to use a superconducting magnet. Superconductors have electrons that conduct electricity with no resistance to flow. One of the consequences of this is that large magnetic fields can be generated —the current supported by a superconductor that generates the magnetic field can be huge without destroying the superconductivity itself. These superconductors are used every day to create large magnetic fields in places such as hospitals for MRI (magnetic resonance imaging) devices to see inside the body. Advanced superconductors might have new applications as magnetic shields for spacecraft. Imagine your spaceship coated in a superconductor that can generate a large magnetic field with a flick of a switch to get the current flowing, creating a magnetic force shield. Physicist and science writer Ian O'Neill discusses CERN’s plan to create a superconducting cosmic radiation shield for astronauts. This is exactly what scientists at the European Organization for Nuclear Research, CERN, are investigating: a new magnetic shield for spacecraft —superconducting magnesium diboride, or MgB₂. A spaceship coated in superconducting magnets would generate a "magnetosphere" around the craft which could be used to deflect harmful projectiles. While we don't have to worry about Klingon torpedoes just yet, we do have to worry about harmful cosmic rays in outer space for future space travel. Cosmic rays are typically charged particles that can interfere with the electronics of a spacecraft, and more importantly, give astronauts a lethal dose of radiation during long space flights. Protecting future spacecraft from these rays is crucially important for the future of any space program, including trips to Mars in the next few decades. And who knows, with the superconducting magnet shields you might be able to escape a Romulan attack on the way. There is a catch, however. Superconductors do not work at high temperatures and there is no room-temperature superconductor. Above a certain temperature called the "critical temperature," the superconductor becomes "normal" and the electrons experience a resistance to flow again. For magnesium diboride, this occurs at a very cold temperature—around -248℃. This is actually fine for interstellar space where the background temperature is a much colder -270℃ or so but it is not conducive to spacecraft visiting other warmer planets. Scientists like me are searching for "room temperature" superconductors that would enable these shields to work at much higher temperatures. This would also enable new advances to society such as cheaper health care, for example, since one wouldn't need low temperatures for MRI instruments to work. However, high temperature superconductivity has been a mystery for decades, and progress is in slow increments. As someone who works on the border between physics and chemistry, I believe that the answer will be found in the discovery of new materials. Historically, this is where progress has been made to raise the critical temperature to one above the liquid nitrogen boiling point of -196℃. These superconductors would be great to use as magnetic shield devices if you were exploring many areas of the galaxy. But they wouldn't work on warmer planets such as Mars without significant amounts of cryogens to keep the magnets cold. Superconducting technology would also have a variety of other uses aboard starships. Quantum computers can perform operations orders of magnitude faster than conventional computers, and would undoubtedly be used on a modern starship. Need to send an encrypted message to Starfleet? If the Klingons have a quantum computer, they might be able to intercept and hack your message, so you had better make sure that you understand the technology. And superconducting electrical systems would naturally be used for the most efficient devices, from starship engines down to tricorders used in away missions. The emergence of room temperature superconductors would spark a transformation of our society that would rival the silicon age of modern electronics. Their discovery is an essential hurdle to cross for the next part of our evolution as a species to a new technological age. It would be highly logical to continue our search for a room temperature superconductor. If only we could make it so. Quantum materials offer strange new worlds of discovery and perhaps most exciting are the technologies we haven't discovered yet—that will exploit quantum effects on scale that humans can easily see. As another Star Trek fan, the idea of magnetic shielding to deflect charged particles in solar flares and galactic cosmic rays is appealing. Charged particles are where the majority of the problem is for the crew. To explore the entire solar system in person, it seems likely that we are going to need every radiation reducing trick in the book, including magnetic shielding in one form or another. Deflecting particles is the minimum. Its the pea sized and bigger we need to be afraid of. Cancer does not matter if a small piece of none magnetic material like granite comes at your ship at a hyper velocity. What I am saying is EM fields are not Star Trek. Projecting a controlling force on a none magnetic rock is. Just like Ham radio is not Star Trek but a smart phone phone is. Of course you can move beyond Startrek.. as millions have and open Swiss Billy Meier's site, theyfly.com, Also read The Pleiadian Mission by Randolph Winters based his 3 months with Billy. See also the You tubes of these 2. Their tech and meterials are 100s of years ahead of ours.